The Obama justice department succeeded in convincing the five right-wing Supreme Court justices to dismiss a lawsuit challenging the constitutionality of the 2008 law, the FISA Amendments Act, which vastly expanded the government's authority to eavesdrop on Americans without warrants. In the case of Clapper v. Amnesty International, Justice Samuel Alito wrote the opinion, released today, which adopted the argument of the Obama DOJ, while the Court's four less conservative justices (Ginsberg, Breyer, Sotomayor and Kagan) all dissented. This means that the lawsuit is dismissed without any ruling on whether the US government's new eavesdropping powers violate core constitutional rights. The background of this case is vital to understanding why this is so significant. One of the most successful government scams of the last decade has been to prevent any legal challenges to its secret surveillance programs. Both the Bush and Obama DOJ's have relied on one tactic in particular to insulate its eavesdropping behavior from judicial review: by draping what it does in total secrecy, it prevents anyone from knowing with certainty who the targets of its surveillance are. The DOJ then exploits this secrecy to block any constitutional or other legal challenges to its surveillance actions on the ground that since nobody can prove with certainty that they have been subjected to this eavesdropping by the government, nobody has "standing" to sue in court and obtain a ruling on the constitutionality of this eavesdropping. "It is essential to the idea of a law, that it be attended with a sanction; or, in other words, a penalty or punishment for disobedience. If there be no penalty annexed to disobedience, the resolutions or commands which pretend to be laws will, in fact, amount to nothing more than advice or recommendation." Thus did the Bush DOJ exploit their secrecy extremism into a license of lawlessness: they never had to prove that even their most radical actions were legal because by keeping it all a secret, they prevented anyone from being able to obtain a ruling about its legality. The Obama DOJ has embraced this tactic in full. In 2008, the Democratic-led Congress (with the support of then-Sen. Barack Obama) enacted the so-called FISA Amendments Act, which dramatically expanded the government's warrantless eavesdropping powers beyond what they had been for the prior 30 years. The primary intention of that new law was to render the Bush warrantless eavesdropping program legal, and it achieved that goal by authorizing the NSA to engage in whole new categories of warrantless surveillance aimed at Americans. Immediately upon enactment of this new law in 2008, the ACLU filed a lawsuit alleging that the warrantless eavesdropping powers it vests violate the First and Fourth Amendments. The plaintiffs in the case are US lawyers, journalists, academic researchers and human rights activists and groups (such as Amnesty) who work on issues of terrorism, foreign policy and human rights. 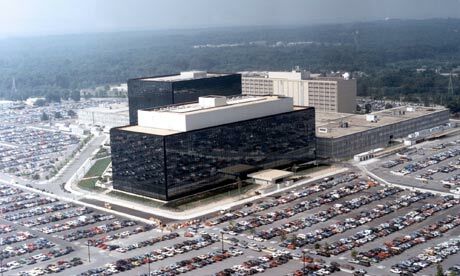 They argued that they have standing to challenge the constitutionality of the eavesdropping law because its very existence impedes their work in numerous ways and makes it highly likely that their communications with their clients and sources will be targeted for interception by the NSA. Because the Obama administration insists that it is a secret who they target for eavesdropping, neither these plaintiffs -- nor anyone else -- can prove with absolute certainty that they or their clients have been targeted. Taking a page (as usual) from the Bush DOJ, the Obama DOJ thus argued in response to this lawsuit that this secrecy means that nobody has "standing" to challenge the constitutionality of this law. With perfect Kafkaesque reasoning, the Obama DOJ says that (1) who we spy on is a total secret, and therefore (2) nobody has the right to obtain a judicial ruling as to whether what we are doing is legal or constitutional. It is true that "standing" is an important doctrine: the requirement that a person first prove that they have been uniquely harmed by a law they want to challenge is not only necessary to fulfill the Constitution's limitation on the federal court's power (which confines their authority to actual "cases or controversies"), but it also prevents the Court from acting as a free-floating arbiter that rules on every political question. Courts can only rule on actual cases where one party has concretely harmed another. The plaintiffs, however, have argued that although they cannot prove they or their clients and sources have been targeted, they are already being harmed by the existence of this law. They have ample reason to fear, they say, that the communications they have with their clients or sources are targeted for interception by the government. That means that this law forces them to refrain from communicating, or to expend substantial sums to travel across the world to meet in person with them, or that these clients and sources refuse to speak to them out of fear of being eavesdropped on. These concrete harms mean, they say, that they have standing to sue the government and obtain a ruling as to whether this law is constitutional. In 2011, the Second Circuit Court of Appeals rejected the Obama DOJ's arguments and ruled that plaintiffs had standing to challenge the eavesdropping law given the concrete harms they are suffering from the mere existence of these eavesdropping powers. Rather than defend the constitutionality of the law, the Obama DOJ appealed this decision to the Supreme Court, and asked the court to dismiss the suit on standing grounds, without reaching the merits of the lawsuit. "[Plaintiffs] have no actual knowledge of the Government's - 1881a targeting practices. Instead, [plaintiffs] merely speculate and make assumptions about whether their communications with their foreign contacts will be acquired under -1881a . . . [Plaintiffs], however, have set forth no specific facts demonstrating that the communications of their foreign contacts will be targeted. Moreover, because - 1881a at most authorizes -- but does not mandate or direct -- the surveillance that [plaintiffs] fear, [plaintiffs'] allegations are necessarily conjectural. . . . Simply put, [plaintiffs] can only speculate as to how the Attorney General and the Director of National Intelligence will exercise their discretion in determining which communications to target." "In my view, this harm is not 'speculative.' Indeed it is as likely to take place as are most future events that commonsense inference and ordinary knowledge of human nature tell us will happen. . . . .
"To some degree this capacity rests upon technology available to the Government. See 1 D. Kris & J. Wilson, National Security Investigations & Prosecutions - 16:6, p. 562 (2d ed. 2012) ('NSA's technological abilities are legendary'); id., - 16:12, at 572--577 (describing the National Security Agency's capacity to monitor 'very broad facilities' such as international switches). See, e.g., Lichtblau & Risen, Spy Agency Mined Vast Data Trove, Officials Report, NY Times, Dec. 24, 2005, p. A1 (describing capacity to trace and to analyze large volumes of communications into and out of the United States)". In sum, the US government has constructed a ubiquitous Surveillance State. It has repeatedly demonstrated that it intends to eavesdrop on the communications of exactly the people who have brought this lawsuit. To prevent them from suing on the ground that the US government's secrecy precludes them from proving with certainty that they are being targeted is to remove the US government's surveillance actions from the rule of law and the constraints of the Constitution. But that is what the Obama DOJ just succeeded in convincing the five right-wing members of the Court to do: allow it to conduct its Surveillance State beyond the rule of law. What's the point of having a Fourth Amendment that bars unreasonable searches and seizures without probable cause warrants if the US government simply shrouds its unconstitutional eavesdropping with so much secrecy that it prevents anyone from challenging the legality of what it is doing? The supreme irony here is that when Obama supported this 2008 eavesdropping law, it sparked intense anger among his own supporters as he ran for president. To placate that anger, he vowed that, once in power, he would rein in the excesses of this law that he oh-so-reluctantly supported. He has done exactly the opposite. He just succeeded in pressuring the Congress, with heavy GOP support, to extend this eavesdroppiong law for five years without a single reform. And now his Justice Department has used the five right-wing justices to completely immunize the law from judicial review (the only way the law could now be challenged is from a handful of extremely unlikely situations, such as if the US government criminally prosecutes the foreign clients and sources of these plaintiffs using information they obtained from the warrantless eavesdropping, and even then, the ability to challenge the law's constitutionality is far from certain). When the new 2008 FISA eavesdropping law was passed, all sorts of legal scholars debated its constitutionality, but it turns out that debate was -- like the Constitution itself -- completely academic. As both the Bush and Obama administrations have repeatedly proven, they are free to violate the Constitution at will just so long as they do so with enough secrecy to convince subservient federal courts to bar everyone from challenging their conduct. I'll be speaking next week in various cities about civil liberties in the age of Obama as well as the rule of law in the US. The cities include Portland, Brooklyn, Washington DC, Amherst, New Haven and Brockport. All events are open to the public; event information is here.